Damon DiMarco is a force. No question about it. With eight books to his name, this author, playwright, and actor has not gotten where he is without diligent planning and working at his craft every day. Damon and I met in college, and a few months back we caught up while he was in LA for a book tour. When I told him what I was doing these days, helping people run successful DIY crowdfunding campaigns, I caught a glimmer in his eye. “So,” he began, “I have this project I’ve been wanting to make a reality for some time. 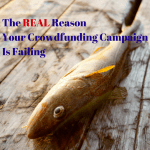 Do you think it would make a good crowdfunding campaign?” Four months after our meeting, Damon’s campaign has outperformed his expectations raising 139% of its funding goal. What did Damon do right? 1) He had a compelling project. 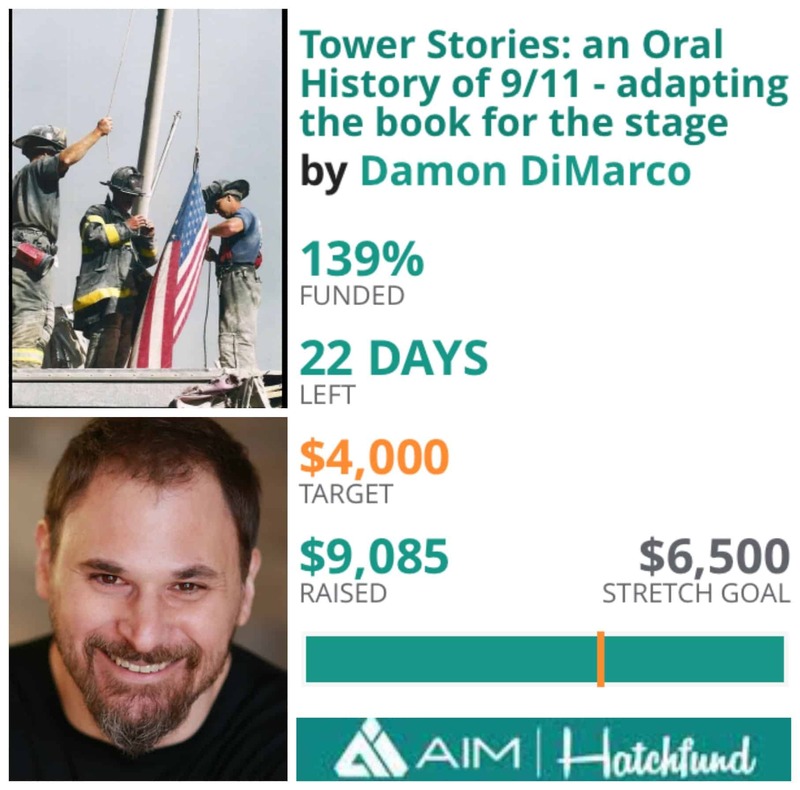 Damon’s dream was to adapt his book “Tower Stories: an Oral History of 9/11” for the stage. As a respected playwright and actor, this was a project he was well-qualified to make real. He also planned to launch his campaign to run around the time of the 9/11 anniversary, which would bring more attention to his project. 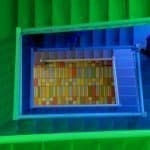 2) Damon communicated his project’s story in an evocative way in writing and on camera. Damon’s campaign updates were filled with compelling stories, much like the ones he hoped to adapt to the stage. And all those years of auditioning paid off on camera as Damon knew how to make the most of his three minute video to communicate a message that would grab his audience. 3) He managed the overwhelming task of running a crowdfunding campaign by breaking it into manageable pieces and persisted until he reached his goal. The discipline Damon honed as a writer working on daunting book projects like “Tower Stories” was a great match for crowdfunding success. 4) Damon did not go it alone. He tapped the network he built as a writer, playwright, and actor throughout his career. He hired a professional to film his video, he sought the help of friends, family, and fans to get his campaign to the critical 20% mark in the first week, and he leveraged the connections he had built as a writer to get some well-placed PR on the project. 5) He hired Crowdfund Better to guide him past the pitfalls that cause too many campaigns to fail. And he hired us long before he planned to launch his campaign. In two very focused meetings taking place months apart and in a series of email communications along the way, we helped Damon set realistic expectations for his funding goal given the resources he already had in place, determined the optimum timing for the launch and close of his campaign, reviewed his plans for the campaign text, video script, and rewards, and made suggestions about which crowdfunding platform would be the best fit for his project. Among the platforms we brought to his attention was Hatchfund, a niche platform for artists that acts as a fiscal sponsor allowing backers to receive tax deductions for their donations. That choice of platform turned out to be a key component of him beating his funding goal. After meeting his minimum funding goal, Hatchfund offered to keep Damon’s campaign open for donations for another 30 days, and it has been in those days that the campaign has almost doubled the funds it has raised. Most platforms do not allow project creators to continue to raise funds after the campaign closes. After each of our hour-long meetings, Damon walked away with his head spinning from the amount of information we compressed into that little bit of time. 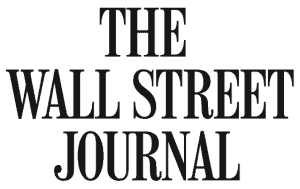 But I believe that when it comes to crowdfunding, forewarned is forearmed. That little bit of planning every day over the months before your launch is what makes for success, or in Damon’s case, blowing past your goal completely. You can purchase his book here on Amazon.